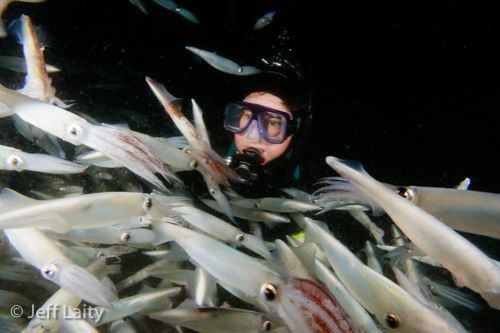 Southern California sees squid runs every few years, often found near sandy submarine canyons in La Jolla (San Diego) and Redondo Beach (Los Angeles). 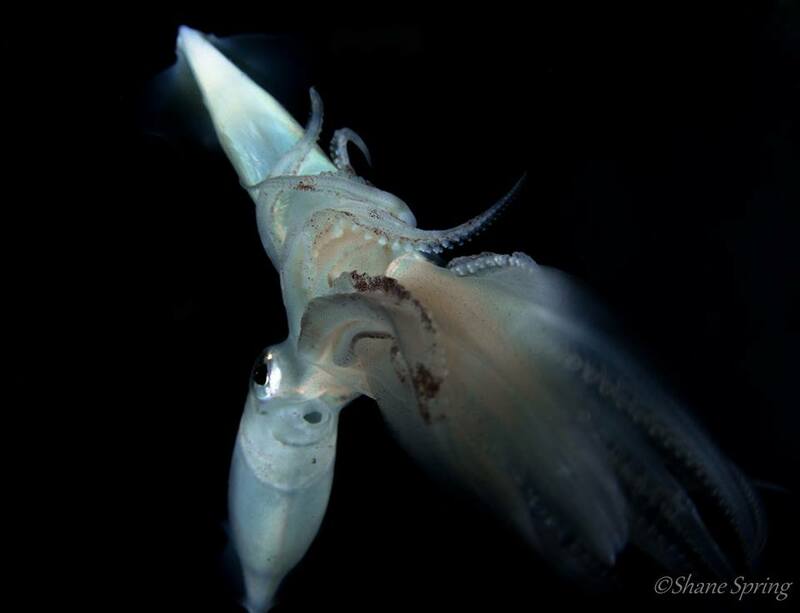 “Squid runs” are seen by divers when aggregations of market squid (Doryteuthis opalescens) rise from the depths on a journey up to shallow water to mate, lay eggs (females) and then die. 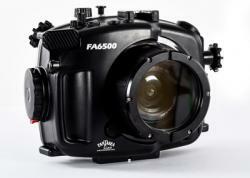 Imagine a few inquisitive squid approaching the beams of your dive lights, making shy eye contact. The number of squid grows and the energy level picks up. 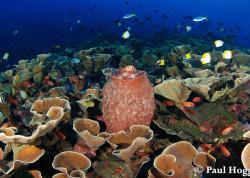 Three males dash towards a female, each with tentacles out in frantic contrast to the parallel lines of the growing wall of squid filling your vision. White everywhere, squid moving so thick you can't see beyond a couple feet but your ears tell you you've descended slightly down the canyon. As you grab your computer two squid are caught in your hand. The red tentacles of mating squid pulse in front of your mask and you have to swipe them away to check the camera LCD, trying to work with using squid bodies as natural strobe light diffusers. 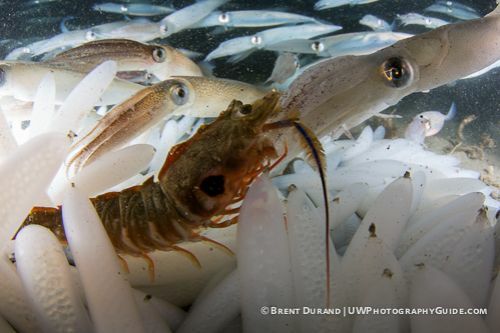 A target shrimp swims by, bouncing off of squid and trying to find the sand again. 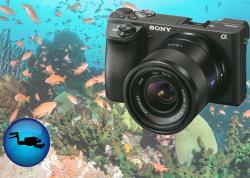 Eventually, it's time to swim up the sandy canyon wall to avoid entering deco and find some black water. But the squid follow, swarming both sides with a few brave squid staring at you as they lead the way up the slope. It wasn't until reaching 40ish feet that the crowd thinned out, totally dispersed by 30 feet. It's pretty exciting! 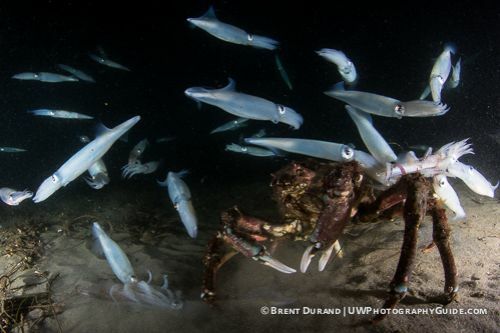 Mature market squid live at depths of around 1500 feet (460 meters) and are about a foot long (.3 meters). 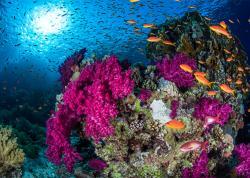 Their lifespan is 6-9 months, with mating happening upon maturation near the end of their lives. Squid runs typically last a few days, however this most recent run lasted a month. I was diving at Vets in Redondo Beach checking out a report of an unusual amount of red octopus the night before and found about 10 squid, one of which was laying a “candle” (a capsule filled with up to 300 eggs that is then anchored to the ground with a long, sticky membrane). 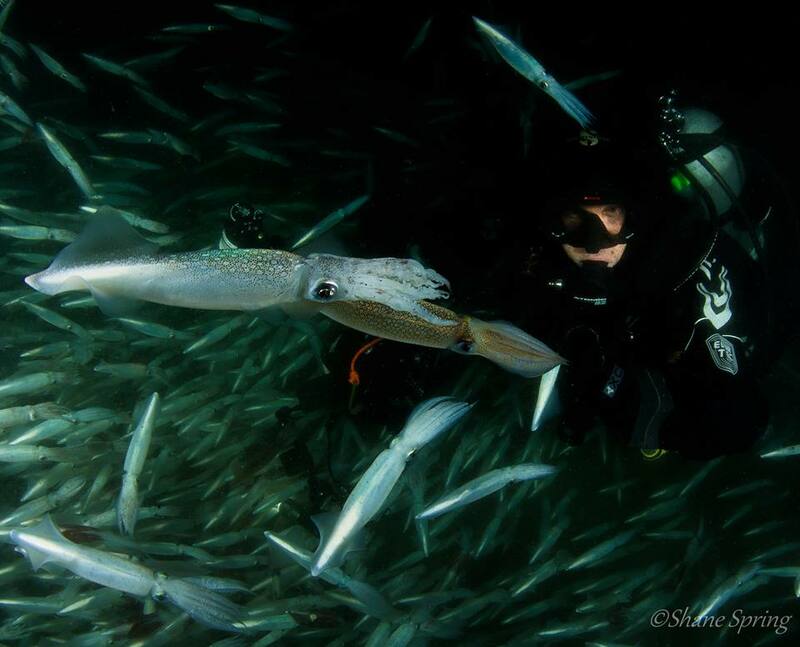 A week later the squid run was in full force and Southern California divers were on the scene to experience swimming through walls of squid for several more weeks. 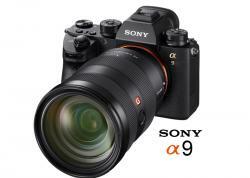 Really unprescedented and amazing! 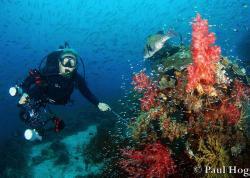 Most of the action happened at a depth of 60ft - 80ft. 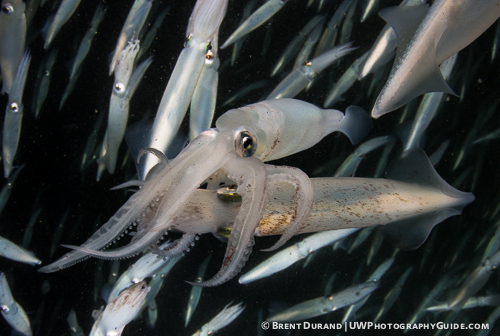 Squid are most active at night, but there were also a good amount of squid present in the early morning hours. 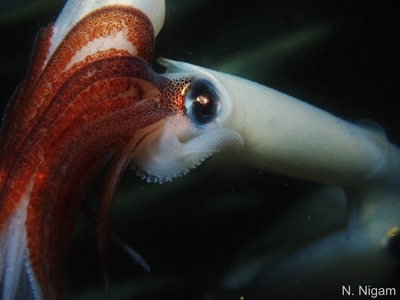 Squid typically die 24 - 48 hours after laying eggs. 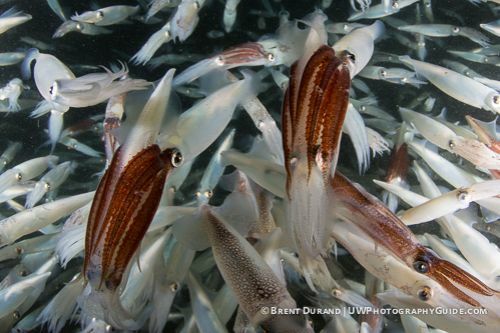 This means that every night, hundreds or thousands of new squid joined the run. 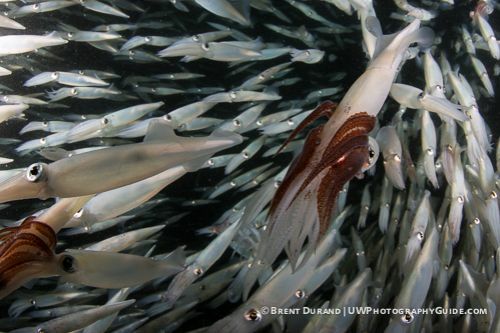 Below are some of many photos captured during the squid run by local photographers.